So I finally had a chance to paint my models and tally up my collection. Seems like the only thing I have left to expand is my Adeptus Mechanicus and Imperial Knight armies! 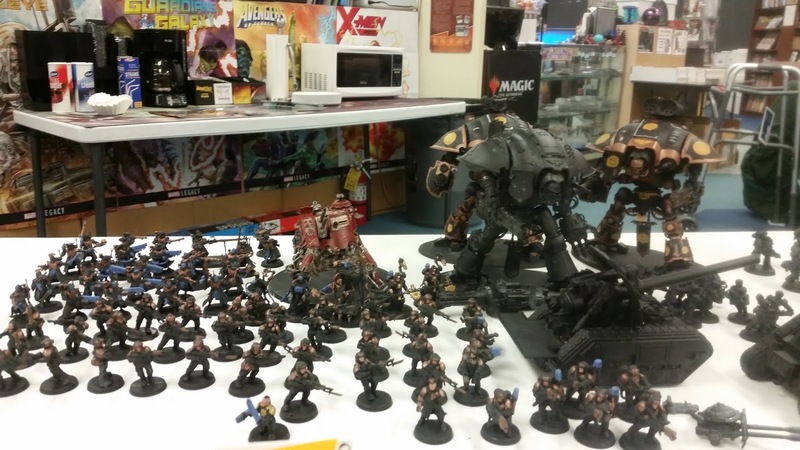 Well, my Imperial Knight army is basically done, I just need to get a single Knight Castellan. Eventually. 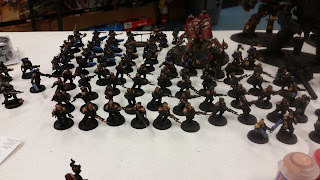 I'm selling off some of my Guard to raise the funds for that (and also to pay off some bills). I am wondering if I should get a couple of Armiger Warglaives/Helverins to support my Knight Castellan or if I should just expand my Adeptus Mechanicus forces. I have no plans to go over 2,000 points for my Adeptus Mechanicus and Imperial Knight army, so it's either one or the other. But this is about my Adeptus Mechanicus task force. For now, I have about 5 squads of Skitarii. 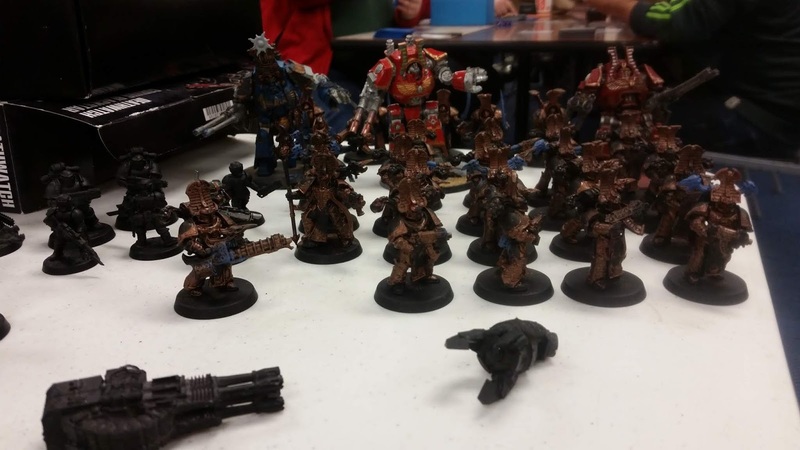 So 2 squads of 5 Skitarii Vanguard with 2 plasma calivers and omispex (Alpha has a taser goad for one of the teams), a squad of 5 Skitarii Vanguard with 2 arc rifles (Alpha has arc maul), 1 squad of Skitarii Rangers with 2 arc rifles and omnispex (Alpha has arc maul and arc pistol), 1 squad of under-strength Skitarii Rangers with 3 galvanic rifles, an omnispex and a single transuranic arquebus. I can probably just get a base for one final sniper Skitarii Ranger, or buy a new box of Skitarii. We'll see. 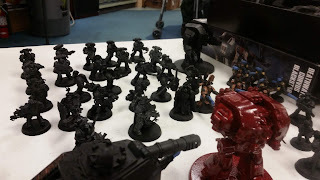 If I don't want to go down the Skitarii route, then I can buy 2 Kastelan Robots. Or perhaps just get 2 Armiger Helverins/Warglaives. In any case, I'll have a long time to think about it, so I don't think there's a need to rush. Finally based my Knight and painted him black! Looking good! I can't wait to finish painting him as I did for his comrades! I also finished painting two of my Leman Russ tanks and the Leviathan Dreadnought. 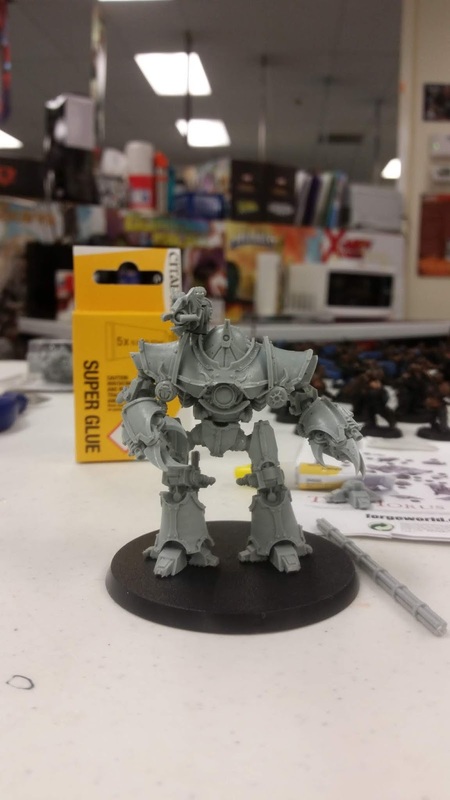 I also procured a Thousand Sons Castellax-Achea Battle-automata for my Adeptus Mechanicus army. They are meant to take the place of Kastelan Robots, their Aether-flame cannon serving as an incendine combuster. I can't wait! Thousand Sons Hellforged Dreadnought army, almost complete. 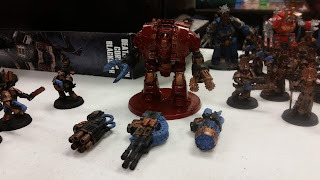 As you can see, I painted all the weapon options for the Leviathan Dreadnought, whch are all magnetized. 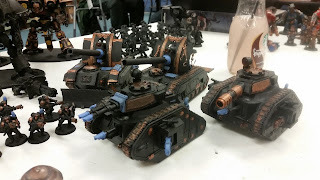 I also painted my Basilisk artillery. And my Leman Russ tanks too. They look okay now. They are no longer pure black or plastic color, so I'm pretty pleased with that. 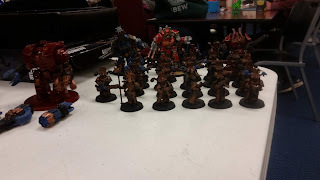 I can't wait to field them alongside my Knights! 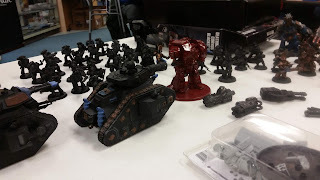 From my experience, they work really well with Deathwatch, so I wonder how they'll work alongside Knights. Now all I need to do is get a Knight Castellan for my Adeptus Mechanicus forces. That leaves me wth 238 points. 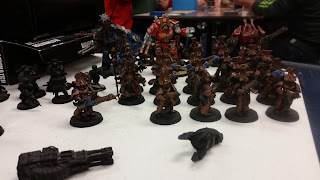 I can either finish up with a 2nd Battalion for my Skitarii, or I can get another 2 Kastelan Robots to make my Adeptus Mechanicus a Legio Cybernetica Cohort. Or I can drop an Onager Dunecrawler to make way for 2 Armiger Warglaives/Helverins. We'll see. I'll take my time to decide it! "New" Imperial Knights for Horus Heresy! My aim for this year!